Entrepreneurs often make the mistake of focusing the majority of their attention on what their competitors are doing instead of gaining first hand market data. When entrepreneurs play “follow the leader” they are playing a dangerous game that assumes the perceived market leading competitor is connected to the needs and pains of market buyers. Market leaders are aware of competitor activity; however they plan their strategy with first hand market data. Market losers set out to do what their competitors are doing…but better. More often than not marketing strategy is made by HIPPOS; the Highest Paid Person in marketing’s Opinions. For example, I had to run some errands in Mesa Saturday and imagine my surprise when I returned to my car and I saw a sea of purple windshield fliers in the parking lot creating marketing litter. In my recent post I discussed how we must make sure when we Chase new business we do so in a way consistent with our brand and our brand promise. 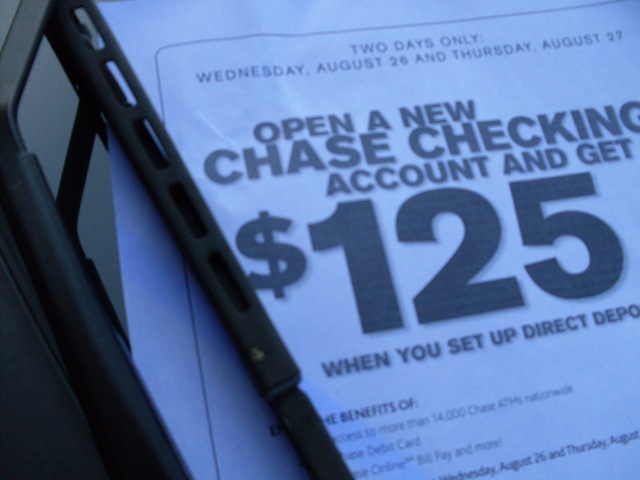 I shared how Chase Bank used a purple windshield wiper flier to drive new accounts at month end in my last post. Do the leaders at TCF Bank think Purple windshield fliers ( Like Chase Bank) is an industry best practice since one of the market leaders does it? 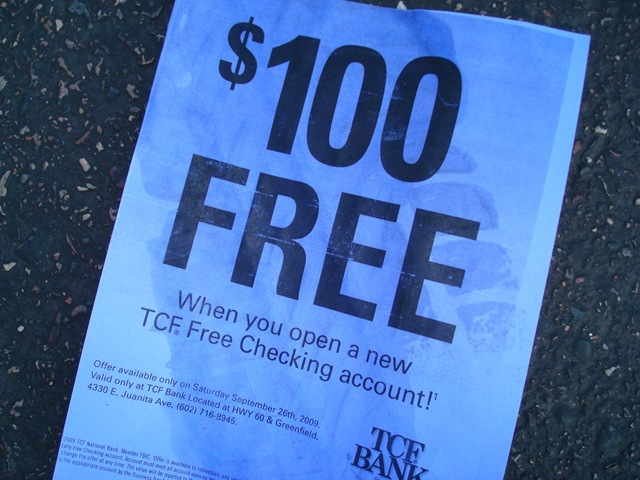 Or was the nimble , much smaller TCf Bank’s efforts the reason Chase Bank tried this strategy? You have been in those meetings…everyone on the cross functional team share their views , and then the highest paid person in the room (hippo) calls an audible from left field based on their gut and or what a market leading competitor is currently doing ( after they are real smart right?). The cross functional team is left scratching its collectives heads as strategy direction is made based on the gut and past experience of the highest paid person in the room. Market leaders gather first hand market data and shape their strategy based on current information. They say ; “rational people, if given the right data will make rational decisions” .What we learn in “rational choice theory” that people make decisions about how they should act by comparing the costs and benefits of different courses of action. Patterns of behavior will develop within the society those results from those choices. The society in this case is competing suppliers battling for market share each day. Decisions made with first hand current market data drive successful strategies. Strategies that are initiated based on what market leading competitors do often fail. Are Hippo’s calling an audible that lacks market data justification? Does your marketing team kick off campaigns that mirror what market leaders in your industry are doing? …how’s that working for you? Are your sales tools built by corporate Hippos who have not met with a customer in over six months…twelve months? Playing follow the leader is a dangerous game, particularly if your Hippos insist you mirror a competitor with the assumption the competitor must know what they are doing. Smart entrepreneurs are aware of what the 800 lb gorilla in their market is doing, but do not blindly mirror their strategies and tactics. Smaller competitors are often more connected to the needs of their market and more nimble. Have you mirrored a competitor and it drove sales that surpassed your ROI goals? Can you share a Hippo based initiative that mirrored a competitor and failed miserably? Besides,when you choose follow , competitor and or a Hippo,the view rarely changes,..ad the outcome often stinks. Entrepreneur Best Practices: #10 “How” you “CHASE” New Business Matters….Do you want pepperoni with that new checking account? I have heard entrepreneurs say; “any marketing is better than no marketing at all…” and they can say this…but they would be wrong! Entrepreneurial leaders must insure the marketing vehicles and tactics they use support their brand and do not create an interruption. Market leaders understand their buyers, their buying process and buying criteria. Market leaders create sales velocity because everything they do has continuity with their brand. Market losers create a variety of marketing tools and “throw them against the wall” of their market and wait to… “see what sticks”. Market losers scare business away, and their energy and budgets are used to grow competitors’ businesses. I Love being a Chase Bank customer. I have used a number of banks over the years…Bank of America, Key Corp, and so on. However the service I get from Chase Bank seems to feel different, it’s as if they know me, and they answer my questions before I ask them. Just yesterday my wife and I met with Dennis at our local branch and he was obviously trained to serve his clients. When other banks have made us feel like we were putting their associates out , Dennis was like the Van’s Golf employees name tags that say “sure not problem” Even the experience of walking into one of their locations “feels” different in how you are greeted and guided to the right person to help you. So imagine my surprise after a doctor appointment to come out to my car and see a windshield flier under my wiper from Chase Bank. This was an interruption for me. Marketing interruptions make current customers pause…and bad things happen when customers pause. Is my bank…Chase Bank, in trouble? Should I maybe check out Wells Fargo or maybe open an account with Bank America again just to play it safe? However my mind quickly came to terms with what has a higher probability of truth; It was the end of August ( end of the month race to hit numbers), and some salesperson , a hunter by nature ( which is awesome) needed business. So as opposed to sitting in the branch waiting for business to come to them, they took initiative and made some purple fliers and more than likely spent hours in the 104 degree Arizona heat stuffing them under windshield wipers in hopes this would drive new business. I had a pizza shop as a client years ago that could ramp up or down his sales by the number of windshield fliers he would have his drivers place. It became a predictable outcome for him over time. However, the way a pizza shop or even a gas station chases new business is significantly different than what I would expect from my trusted bank, and the two should never be confused. As I discussed, entrepreneurial leaders have bad things happen when they “assume”. 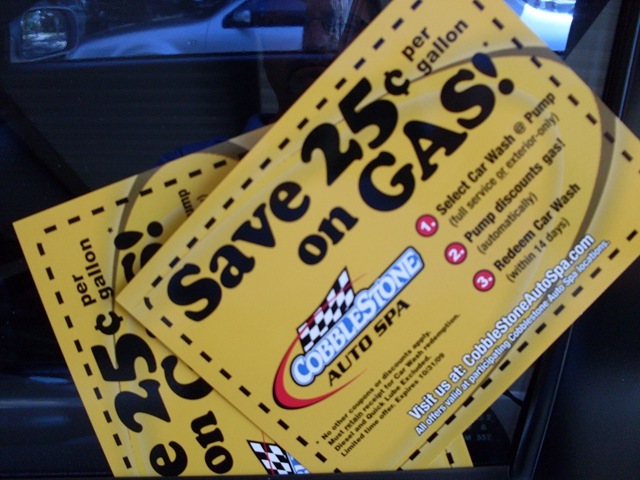 “Well if windshield fliers work for pizza shops and gas stations…why not…” The “why not” is whatever you do must be intentional and have continuity with your brand image, your brand promise in the minds of buyers in your market. If marketing does not create tools that help salespeople hit their objectives, sales will create their own…and although you appreciate their “be a part of the solution” attitude it may cause your market to pause. When markets experience a pause, an interruption in the brand image …bad things happens. Are your salespeople creating their own tools to hit their numbers? What policies and procedures do you have in place to insure your brand image is protected and reinforced? Have you ever had your salespeople create their own tools…tell me about it. 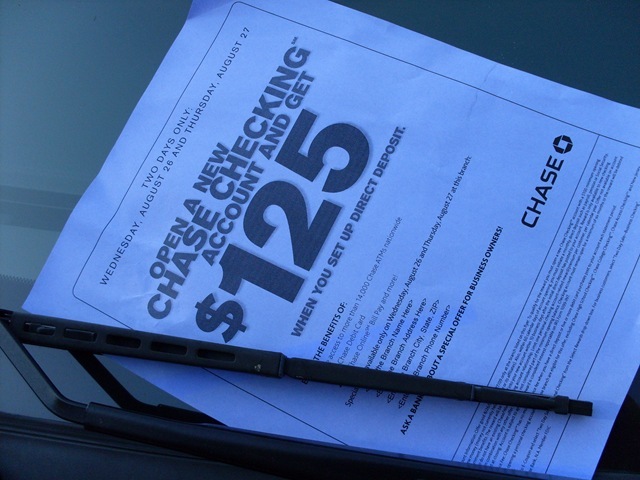 From the number of fliers blowing around in the parking lot now as “marketing litter” I could tell most of the people who had fliers under their wipers did not value this communication attempt by Chase Bank. I would be interested to know from Chase Bank if this tactic is a marketing approved new business program or if I was correct a local branch went off the marketing reservation. If this tactic does in fact drive needed new business at moth end that is greater the negative impact it has on their brand in the mind of the market. A Brand's Odyssey Toward Self Discovery. Get the book. 50 Ugly Truths About Owning and Running Your Own Business Get the eBook.